Joining alumni and friends at the October 1 McKnight Center groundbreaking were representatives from the School of Visual and Performing Arts, OSU President's Office, New York Philharmonic and Patron donors. From left: Andrew Kimbrough, Howard Potter, Rebecca Brienen, Matthew VanBesien, Burns and Ann Hargis, John Giovando, Kevin Kamau, Carl Thoma, Billie and Ross McKnight, and Bret Danilowicz. Oklahoma State University celebrated the groundbreaking of its new performing arts center on October 1 by announcing a residency partnership with the New York Philharmonic. Project leaders and major donors were part of the standing-room-only celebration at the future site of The McKnight Center for the Performing Arts' main stage. The New York Philharmonic will open The McKnight Center in fall 2019. In addition to multiple performances conducted by future New York Philharmonic Music Director Jaap van Zweden, the residency partnership will include educational opportunities for OSU students with Philharmonic musicians and management, such as masterclasses, audition workshops and lectures. The residency will be featured during the inaugural week of The McKnight Center, which is expected to open in fall 2019. "We dream big," says Ross McKnight, who with his wife, Billie, announced a $25 million gift in March to establish a programming endowment to support and name the Center. Work to bring the New York Philharmonic, he says, was underway long before the spring gift announcement. Securing a partnership with the oldest orchestra in the country and among the most prestigious in the world was important to ensure the Center would be transformational, Billie and Ross McKnight say. "This is the caliber of performances we're going to support with this Center," Ross McKnight says. "What we envision and what we are working to establish here will go on for hundreds of years, and not just for the music school, but for the performing arts in Oklahoma." "And our students will be so excited to work with world-class musicians," Billie McKnight adds. "They will interact with the very best, and it will influence their education a great deal." To date, $46 million has been raised for the project. The McKnights have been instrumental in this milestone, working with President Burns Hargis on the vision for the performing arts center. Including the McKnights, 16 households and organizations have given $1 million or more to the project. These Patron-level donors were recognized at the halftime performance during the OSU vs. Texas football game that followed the groundbreaking. "It makes a statement and shows that the arts are important to the University," Hargis says of the level of interest and commitment from others. "This expansive partnership presents a once-in-a-lifetime opportunity for our talented music faculty and students to interact with, and be inspired by, members of one of the world's greatest orchestras. I am confident we are well on our way to establishing a vital hub of creativity and collaboration for the performing arts at OSU." The vision for The McKnight Center resonated with Patron donors Julie and Russ Teubner, who are OSU alumni, longtime residents, entrepreneurs and active arts advocates in downtown Stillwater. "As an OSU graduate, resident or whatever hat I'm wearing, I'm thrilled," Russ Teubner says. "This continues to build the brand of the university in ways unexpected." Teubner says he appreciates the way President Hargis frequently ties The McKnight Center to OSU's mission as a land-grant university, which directed Oklahoma State's teaching focus on practical agriculture, science, military science and engineering, but "without excluding ... classical studies," which includes the arts. "We've always had a great arts program — it's almost been underground. But this puts us front and center," he says. "This will enhance the cultural life in Stillwater. We're getting pretty darn close to being a great little city with big things going on." The McKnight Center will feature a main performance hall with 1,100 seats, a recital hall with 220 seats, outdoor plaza and state-of-the-art technology. Beck Design is the architect for the project. Dr. Howard Potter, professor and head of the Department of Music, says The McKnight Center will set the foundation to invite world-class musicians and artists to Stillwater. "This residency program with the New York Philharmonic begins a new era for performing arts at our school and in our state," he says. New York Philharmonic President Matthew VanBesien says partnerships like the one with OSU aren't that common among U.S. orchestras, but he expects they will be more prevalent in the future. "Our partnership with OSU is not going to be about performing and going away," he says. "It's going to be about building relationships. We're going to work to engage all of the student population. What's great about music and the arts is that it's a shared experience with people." VanBesien says with three years to plan, he's looking forward to creating something "extraordinary," adding that the full force of the Philharmonic will be in Stillwater. "I'm sure we'll have a few surprises up our sleeves." OSU junior trumpeter Kevin Kamau spoke at the groundbreaking event and called the New York Philharmonic's presence "beyond a dream come true." "The McKnights' gift is something that is so incredibly special and will really change what we do here," he says, dressed in his band uniform. "It will change how we bring in students, and how we bring music to the community and make people really unite and be a part of music; because that's what music is all about — being diverse and unifying to make one product. This will truly make me proud, and make all of our former, current and future students proud of what we are able to do in this facility and highlight all of our talent," he says. "So incredible are these opportunities we've been given." VanBesien says he is eager for the opportunities the partnership will afford the New York Philharmonic as well. "While we often hear how residency partnerships benefit faculty, students and the regional community, I can say from experience that the musicians and management of the New York Philharmonic also benefit immensely from the creative energy stemming from academic and professional collaboration," he says. "We very much look forward to performing at what promises to be a spectacular new performing arts center and to engaging with the university and the community in Stillwater." In its 175th season, the New York Philharmonic has an impressive history, and VanBesien says with that tradition is a responsibility to share the arts with people all over the world. "It's a unique and special opportunity to play an important role and help seed a legacy here for Stillwater, the people of Oklahoma and the region," he says. Senior music education major Grant Harper performs "Toredor" from the opera Carmen. The OSU vs. Texas halftime show honored gifts from the McKnights and Patron donors and celebrated the residency partnership with the Philharmonic with a special presentation by the OSU Marching Band. The group of about 300 students played selections from French composer George Bizet's opera Carmen. Band formations included the McKnights' names, NYNY and a sequence conveying OSU's appreciation for the New York Philharmonic. "I was truly proud of our performance and ecstatic at the commitment our band members made to making this ambitious show a reality," says OSU Band Director Doug Henderson. "It was very special, and something we've never done before. It truly showcased the incredible talent we have throughout our music department." 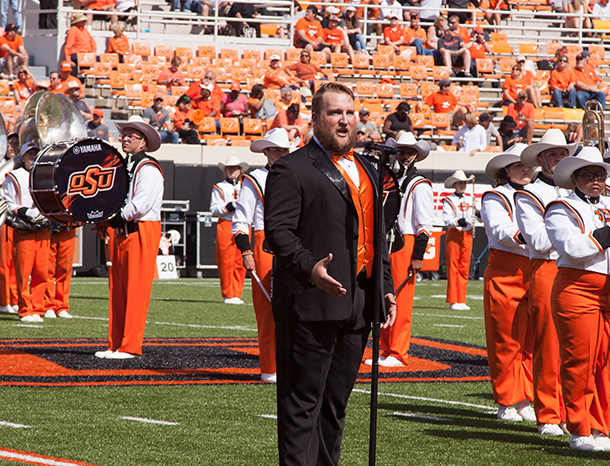 Senior music education major and opera singer Grant Harper was both excited and nervous to take the 50-yard line to perform "Toredor." The Fort Smith, Arkansas, native says he immediately agreed to sing when he learned it would be to thank donors. "The knowledge that will be brought from professional groups such as the New York Philharmonic is invaluable to music students," he says. "I was absolutely honored to play such a visible role. It was by far the biggest crowd I had performed for and by far the biggest reason." The platform also allowed him to increase the community's awareness of OSU's music programs and the quality of students' work. He's hopeful more people will be open to attending student performances such as opera, choir, and various ensembles and orchestras. He says because of The McKnight Center, students will get even more opportunities to attract bigger audiences. In the meantime, the halftime show was just a glimpse at the diverse and deep talent at OSU. "To be invited to sing on the field is such a rare occurrence. I was humbled and greatly appreciative of the opportunity to spread my art," he says. "I've been stopped multiple times in the community and been asked if I was the guy who sang in the stadium. I've never had this opportunity to be the popular guy thanks to my voice, so it's really still an amazing honor to have done it." Work to fund The McKnight Center is still not complete. Another $15 million in private support is needed to fulfill the Center's transformational vision. Still more is required for the facility itself with naming opportunities throughout. By helping advance this project, you join others who are committed to the performing arts at OSU and the generations this incredible facility and its programming will serve. To learn more, visit mcknightcenter.okstate.edu.